The Smithsonian National Air and Space Museum (NASM) maintains the largest collection of historic air and spacecraft in the world. Located in Washington, DC on the National Mall, it also has a companion facility at the Steven F. Udvar-Hazy Center near Washington Dulles Airport at Chantilly, VA. The space shuttle Enterprise is housed at the Udvar-Hazy Center, as is one of Amelia Earhart’s planes. The NASM holds in trust some 50,000 objects, including air craft, space craft, engines, rockets, uniforms, space suits, balloons and artwork. 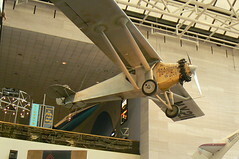 The Wright Brothers 1903 Flyer is on display with related artifacts. A whole section is dedicated to the Wright Brothers with original and replica flying machines. Okay, you’ve got some money, you’ve got some land up on a hill, and you’ve got some brains. But, what you don’t have is a place to live! What will you do? What will you do? Thomas Jefferson, never at loss to come up with a new idea, decided he was going to build a house on the hill as the centerpiece to his 5,000-acre plantation. And talk about privacy! You can’t see it from the road, even if you know where to look. Preparation of the site began in 1768 with construction beginning the following year. With approximately 11,000 sq. ft. of living space, this is not your basic suburban master-planned community house. Monticello was designed by Jefferson after a visit to Europe. The Roman neoclassic design contains forty-three rooms following a remodeling expansion completed in 1809. Much of the construction material came from the land around the house. The window glass came from Europe and about one-third of the glass now in the house is original. Of interest is Jefferson’s bed, which he designed after seeing alcove beds during his time in France. Taking the idea of beds built into walls upon his return from Europe, Jefferson redesigned Monticello, adding an alcove bed to his bedroom, but leaving both sides open. This connected his bedroom with his study. So, Jefferson was never totally hidden away in his bedroom, but was able to access both rooms easily. Obviously, Jefferson was not a man to rest easily. Tours of the house run constantly throughout the day with timed tickets, so it is best to visit other areas of Monticello following your background tour. Those background tour areas include the Gardens, dependencies, Mulberry Row and Jefferson’s gravesite. Tickets are available throughout the day on a first come-first served basis. Tours of the house begin every 10 minutes. Hours Vary – See Website for calendar of hours. Tomorrow – Come back for a retrospect on our blog and some things to be thankful for. A greatly expanded visitor’s center is now located at the former Tredegar Iron Works overlooking the James River. The former foundry pushed out cannons and high quality munitions for the Confederacy during the Civil War along with steam locomotives. Fortunately the building survived the burning of Richmond in April 1865 as Confederate troops were ordered to destroy munitions plants as they evacuated the city. 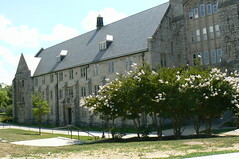 Commonly called just “Virginia Tech,” the Virginia Polytechnic Institute and State University is located on 2,600 acres in Blacksburg, VA and contains 125 buildings. It was founded in 1872 as a public grant college and has worked its way up to be one of the top public universities in the United States.